At the time Shepherd Center began to recognize dropping participation rates, it already had comprehensive educational courses and a generalized (versus one-on-one) peer support program aimed at helping patients with SCI and family members during that transformational period. Even though those programs contained thorough information and provided a nurturing environment, there was clearly a need to better engage patients in a manner more specific to them. The challenge was to enhance services to better assist individual patients make sense of their injury and reconstruct their habitual ways of thinking moving forward. This became the focus of a major revision in how Shepherd Center provides patient-centered rehabilitation services to people with SCI. In 2013, Shepherd Center received a grant from the Patient-Centered Outcomes Research Institute and a gift from the local Robert W. Woodruff Foundation to develop, implement, and evaluate the effectiveness of several enhancements to its discharge planning services. This research project included intensive (one-to-one) peer mentoring, peer-supported education, and development of an electronic patient portal with links to resources supporting self-sufficiency post discharge. Many of these concepts were based on the work of Kate Lorig and her chronic disease self-management program, which involves peer mentoring, peer-led education, and emphasis on specific problem solving. But what defines success and happiness differs from person to person. For one person, it may mean being active in sports and in the community. For another, it may mean starting a family or going to school and starting a career. The individual needs, interests, and desires of a person can have varying effects on his or her self-evaluation and recovery after an injury. To help a patient come to terms with his or her injury, it is important that services address specific problems and aspirations during the rehabilitation process, which peer support is very effective at doing. What makes the intensive peer mentor program at Shepherd noteworthy is the organized and deliberate way that it addresses each individual patient. The intensive peer program has four full-time staff mentors (program managers) who recruit, train, and manage a large pool of more than 200 volunteer mentors. They are able to match patients with specific mentors and evaluate the results. The goal is to match patients with a mentor as soon as possible in their admission. The ideal mentor is one who is close to the same level of disability, or in a similar place in life, but has at least several years of experience living with SCI. This is coordinated by keeping a detailed database of available mentors segmented by background information (marital status, age, children, etc. ), level of injury, date of injury, type of employment, transportation status, what procedures they have had, topics of interest to them, availability, etc. Once a mentor has been matched with a patient, the program managers follow up with both the patient and mentor on the interaction to evaluate compatibility. “I think the uniqueness of the program is that we have this nice marriage, if you will, between consistent, regular staff members who are employed and people that just want to give back to the community,” says Gassaway. Minna Hong, the SCI Peer Support Manager at Shepherd Center, describes the difference between the traditional and intensive peer programs with one word, “Manpower.” The grant-funded research project has allowed Shepherd to infuse peer mentors throughout the rehabilitation continuum, and actively connect with patients in practical ways that were not previously possible. That requires involving a lot of the right people and starts with quality recruitment and training. 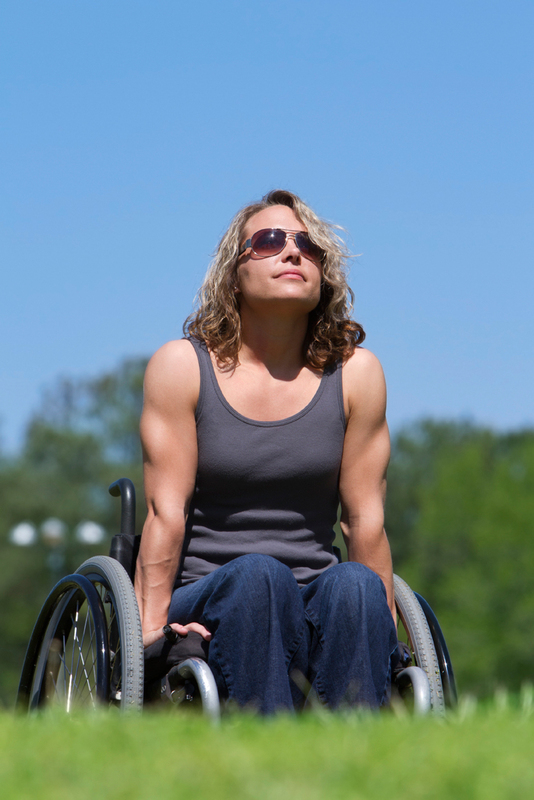 Once selected, each volunteer peer mentor is first trained by the Christopher and Dana Reeve Foundation. The new mentor then participates in Shepherd’s volunteer training and must pass a background check. Finally, each mentor completes “clinical training,” which involves instruction from clinicians and the peer support program managers, attending education classes and meetings, and being observed in interactions with patients. The training of, and services offered by, peer mentors is done in complete cooperation with other clinical departments (therapy, nursing, etc.) and has been integrated into those rehabilitation processes. Focusing on problem solving means immersing into the individual challenges faced by patients. It means using common language, real-life application, humor, and personal stories to engage them and their families. It means making time for private counseling and personal connection. The intensive peer support program accomplishes this across a variety of fronts. First the mentors emphasize one-on-one time with patients while admitted plus regular follow-up contact post discharge. 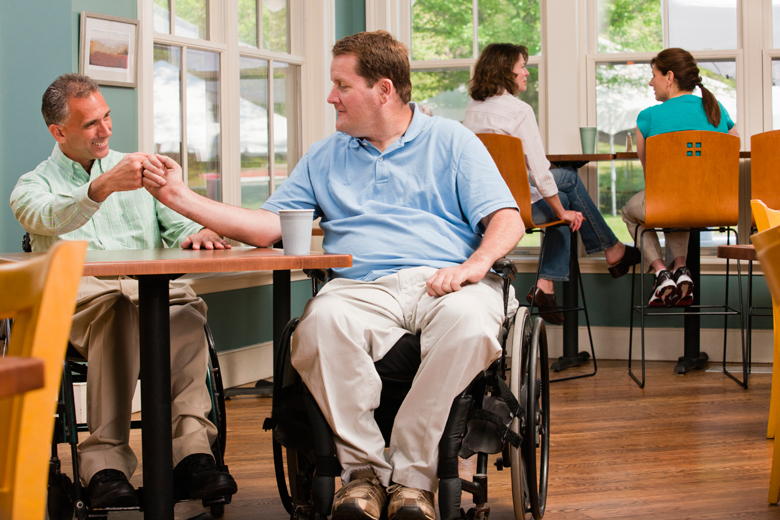 Second, peers are incorporated into co-treatment sessions with occupational and physical therapy to demonstrate necessary functions like hand movement or getting from the floor into a chair. Third, peers run support groups and classes on various topics, including men’s and women’s sexuality, general peer support, and even caregiver support for family members. And, finally, peers are the focal point of patient self-care classes. Another component of the peer support program at Shepherd, and one necessary to ensure long-term success, is continued guidance in community and other familiar settings. Peers assist therapists in taking patients into real environments, such as restaurants, malls, or city buses, to demonstrate the importance of what is being learned in therapy sessions. The lessons range from overcoming unexpected obstacles (e.g., lack of curb cuts, inaccessible doorways, or how to remove money from your wallet) to learning practical self-advocacy skills. Peers also host organized social events in the community to engage patients with community members and help develop new networks of support. The overarching principle is to ‘meet the patients where they are.’ In addition to the major approaches already outlined, mentors encourage conversation during admission and after discharge through emails, phone calls, and a dedicated Facebook page. Informative videos (produced by the peer support team) and interactive dialogs are very effective in continuing learning and support that began during inpatient rehabilitation. These results give Shepherd Center reason to actively share not only the results of the study, but also the processes. Gassaway, Hong, and Jones have been on a tour of national conferences to present the findings and consult on how to implement similar programs. This fall, they will be presenting at ASCIP and ISCoS conferences in September and the ACRM conference in early November. They will also be conducting a CARF webinar titled Peer Mentoring and Patient-Directed Transition Support After Traumatic Spinal Cord Injury in September. As analyses are completed on additional measurement categories, those findings will be included in their courses. (Editor's Note: A recording of the CARF webinar can be purchased at: http://bookstore.carf.org/product/INT-3520.03-29.html). Dr. Jones is the vice president for research and technology at Shepherd Center and co-director of the Wireless Rehabilitation Engineering Research Center, a joint research program of Georgia Tech and Shepherd Center. His research interests address the design and management of programs and services that promote full inclusion of people with disabilities. 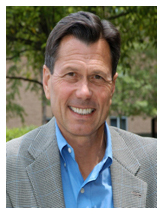 Prior to joining Shepherd Center, he was executive director of the Center for Universal Design at North Carolina State University. Since 2012, he has served as a scientific reviewer for PCORI's Communication and Dissemination Research program. He is also a longtime CARF surveyor. Ms. Gassaway is the director of health and wellness and a senior clinical research scientist at Shepherd Center. Julie has been involved in clinical outcomes research for more than 25 years, with the past eight focused on spinal cord injury rehabilitation. Current funded projects focus on patient-centered care management and research for persons with disabilities. She has authored over 60 peer-reviewed publications and serves as a reviewer and occasional guest editor for several rehabilitation journals. 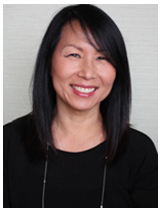 Ms. Hong has fifteen years of experience working with the SCI population. She has been interviewed for and written articles in over fifteen national publications on living with SCI and related topics. 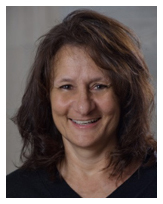 She has lectured a series on relationships after SCI for workers' comp adjusters; created an email listserv of SCI peers to gather and share information; helped develop peer-centered education modules; and established women’s, Latino, and caregiver support groups. She has also guest lectured at several Georgia universities about SCI related topics. Editor's Note: An expanded version of this article first appeared in the August, 2016 issue of CARF's Medical Rehabilitation Connection newsletter. That issue features a profile of Minna Hong, a compare/contrast sidebar of Shepherd's traditional vs. intensive peer support models, synopses of Response Shift Theory and Transformative Learning, and a brief overview of Shepherd's Patient Portal. View the August, 2016 issue and other past Medical Rehabilitation Connection newsletter issues at: www.carf.org/Resources/Newsletters/RehabConnection/Rehab-Connection. This article is amazing. As a person living with SCI related diabilities and having both the empathy for disabled people in general but also the continued struggle to cope with the best and worst parts of this traumatic disability, I feel truly inspired by the effective way so many people who dedicated their time and intellect to further advance positive outcomes for those of us who desperate need this type of attention. I feel like I am frequently ignored and misunderstood by those who have no idea what its like to have been thru this specific injury (SCI). Knowing that my concerns about the quality of care I receive and those like me are addressed gives me a smile. It is extremely encouraging to see that improvements are being made by and for people with SCI disabilities. I'm excited to read that education/template is being laid out for reference and more for those of us that need the know how. Awesome article. So glad the objective findings support what was hypothesized as the benefits of peer support!! !